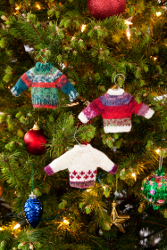 Your tree will look so warm and fuzzy once you hang some Noel Knit Sweater Ornaments on it. This free Christmas knitting pattern from Red Heart Yarn is one of the most popular ornaments of the season, and it's not hard to see why. The knitting pattern puts your skills to the test, and the results are both festive and funny. You can make a custom handmade Christmas ornament for everyone in the family. RED HEART® Heart & Sole® with Aloe: 1 ball each 3973 Christmas A, 3931 Berry Bliss B, and 3115 Ivory C.
Susan Bates® Double Pointed Knitting Needles: 2.75mm [US 2]. Stitch holders, yarn needle, 12" (30 cm) length of 16 gauge aluminum wire. GAUGE 28 sts = 4" (10 cm); 40 Rounds = 4" (10 cm) in St st. CHECK YOUR GAUGE. Use any size needle to obtain the gauge. (1 Super Fine) RED HEART® Heart & Sole® with Aloe, Art. E745 available in solid color and multicolor 1.76 oz (50 g), 213 yd (195 m) balls. Ssk = Slip next 2 sts knitwise, one at a time to right needle; insert point of left needle into the fronts of these 2 sts and knit them together from this position. Finished Measurement: 2½" (6 cm) wide x 3½" (9 cm) long. With A, cast on 20 sts and distribute among 4 double pointed needles as follows: first needle 6 sts, second needle 4 sts, third needle 6 sts, and fourth needle 4 sts. Place a marker and join, being careful not to twist sts. Rounds 1 - 3: * K1, p1; repeat from * around. Round 5: * [K1, p1, k1] in same st (2 sts inc), knit to end of needle; repeat from * around–28 sts. Rounds 6 - 7: Knit. Repeat last 3 rounds three times more–52 sts. Round 17: K5 and place these sts on holder for left sleeve; k13 for back, cast on 3 sts; place next 13 sts on holder for right sleeve; k13 for front, cast on 3 sts, knit next 8 sts and slip these sts onto holder for left sleeve. Rounds 18 - 28: Working on these 32 sts for body only, knit around. Rounds 29 - 32: * K1, p1; repeat from * around. Bind off. Round 1: Pick up and k3 sts across cast on edge of left underarm, k13 sts from holder–16 sts. Rounds 2 - 4: Knit. Round 5: K2tog, knit around–15 sts. Rounds 6 - 8: Knit. Round 9: Ssk, knit around–14 sts. Rounds 10 - 12: Knit. Rounds 13 - 16: * K1, p1; repeat from * around. Bind off. Rounds 30 - 32: Work as for Pattern 1. Change to B, work Rounds 1 – 12 of Left Sleeve. Round 13: Change to C, knit around. Complete same as for Pattern 1. With C, work Rounds 1 – 20 same as for Pattern 1. Round 21: Join B and begin working Fair isle pattern as follows: * K1 with C, k1 with B, k2 with C; repeat from * around. Round 22: * K3 with B, k1 C; repeat from * around. Round 23: Repeat Round 21. Round 24: * K3 with C, k1 with B; repeat from * around. Round 25: * K1 with B, k1 with C, k2 with B: repeat from * around. Round 26: Repeat Round 24. Rounds 27 - 28: Change to B, knit around. Round 29: Change to B, knit around. With C, work Rounds 1 - 12. Round 13: Change to B, knit around. Rounds 14 - 16: Work same as for Pattern 1. Shape wire into hanger shapes. See actual size guide below. Abbreviations: A, B, C = colors A, B, C; k = knit; mm = millimeters; p = purl; st(s) = stitch(es); St st = Stockinette stitch; tog = together; [ ] = work directions in brackets the number of times specified;* or ** = repeat whatever follows the * or ** as indicated.